Mr. Stewart’s shop sat among many other shops, all small, all old and all in need of repair. The lane broke off from the main road and led down to the harbor. Like the other shops, Mr. Stewart’s bubbled with mice. They got into his goods and wares and made a mess of everything. One day Mr. Stewart took his cat, Donald, to the shop. “You’ll catch the mice for me, won’t you, boy?” He stuck the cat in the back room and closed the door. Donald didn’t like the dark, especially in a strange place. He sat in the corner licking his paws. The sound of scuttering caught his attention. His ears went straight up and he listened carefully. “Mice!” Even though Donald didn’t like the dark, he did like to eat mice. A light shone through the window. Donald looked up and saw the moon. Its glow lit the room up enough for the cat to see everything. A barrel stood in the center of the room. Donald saw several mice prying the lid off. He waited until they’d accomplished their task and then pounced on them. 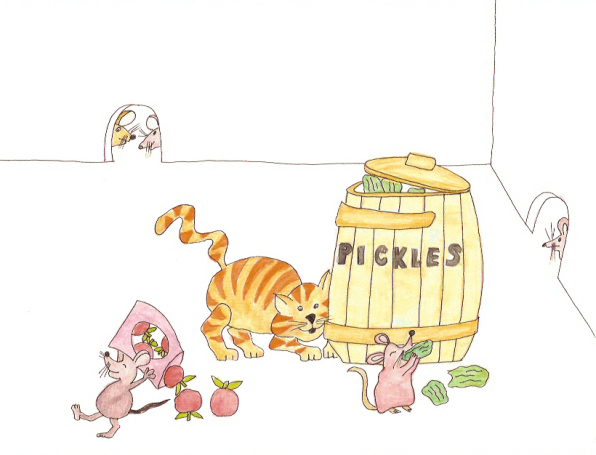 The mice scattered into mouse holes except for one, who busily munched on a pickle. When Donald came closer to it, it squirted him in the eye with pickle juice. Donald ran around meowing and holding his sore eye. He saw another mouse carrying a bag of fresh tomatoes. When Donald moved in closer, the mouse threw the tomatoes at him. They splattered all over his striped fur. All night long it was the same thing. There were just too many mice! Donald couldn’t keep up with them. As the hours passed the cat knew Mr. Stewart would be coming back soon and expected to see a pile of dead mice. Donald waited for a cloud to pass in front of the moon. When the room filled with darkness he crept over to the pickle barrel. Once the moon shone again, the mouse squeaked in terror and stuffed a pickle into Donald’s mouth. Instead of being angry and clawing the mouse to death, Donald quite enjoyed the taste of the pickle. He lifted the lid and picked out three of the biggest he could find. He lay with his back against the barrel and nibbled away, not caring how many mice ran around the storage room. Donald didn’t mind. He didn’t want to be stuck down at the shop anyway. Donald curled up in front of the fire and fell asleep while the pitter patter of raindrops fell on the roof.